I have been disrespected and insulted in my playing ability. Why don’t I always play at a high level? Because it can feel like work and be very long, drawn out and tedious. I will only play my T110E5 for the next 30 days solo. I intend to exceed 65 wr 2500 dmg with 0 platoon rate. This is a highly analytical game so even players who have a lower skill ceiling can do well. I played one game with my normal casual playing style. What a disaster. Lol. 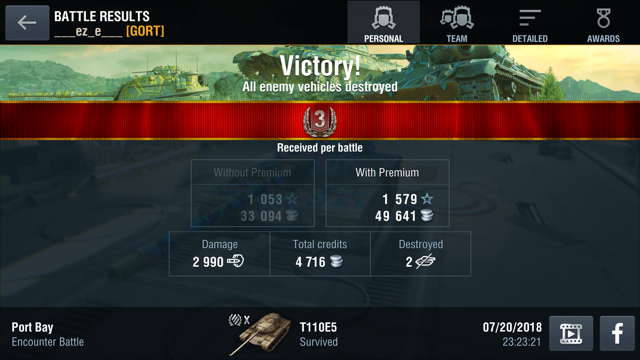 So afterwards, I did a little studying by watching some recent T110E5 videos to remind myself how it should be played. I wasn’t using it as a hulll down tank and chasing enemy. Funny. My next two battles after some adjustments. Mainly hull down. Hopefully I’m just getting warmed up. In other posts I’ll go over some of the other adjustments I made in more detail. Edited by ___ez_e___, 21 July 2018 - 03:16 PM. But did you watch video's from uni who toons? If so why your a so much better player then youtubers who toon. You couldn't possibly learn anything from a player who toons could you. I mean you said yourself platooners are scrubs. SMH some people. Edited by Untrust______, 21 July 2018 - 03:30 PM. Good luck, I mean that sincerely. The 2500 damage shouldn’t be hard, it’s six-seven shots. I have played solo most of my time in Blitz. When you carry and do good it is an amazing feeling but also with no deliberate help from a platoon mate this game gets super frustrating. You are at the mercy of nubs and potatoes. I would suggest not running a tier x for this test. Maybe run the IS3 Defender, your stats are decent in it and you wont lose credits like you will in the E5. Good luck and sorry if I have insulted you in the past. At least they didn't insult something that matters? I mean, they could have been all like, "You have an ugly face." You're stuck with that. You can't watch some YouTube videos and fix that. You only have a bag with two holes cut in it. I think 65% win rate is proportional to 2500 average damage. 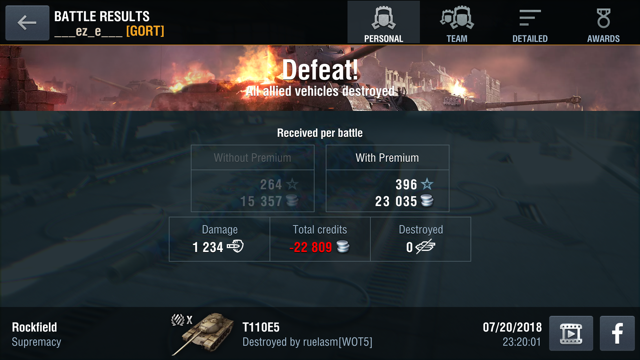 You would think, but tier 10 is a different beast. I've got 2500 average damage in my M60 and a 46% winrate after 60 games, which I would think is a symptom of me playing it like my Object 140 there for a while, but still. To OP, good luck with it, I don't think it's remotely possible for a player of your caliber to do that over a statistically significant number of games, but I'd be happy to be proven wrong. Well, goodluck to you. As me, I research a lot of stuff. Just checked your blitzstars. You don’t really seem be remotely close with the damage wise, nor the winrate. And this is just the first 3 hours. Just a tip imo, you should probably up your survival rate (less aggressive , more efficient). That should help with your damage and winrate. Heres the link to your thing. I just saw what you said about first 3 hrs, but I’m a bit busy with life on weekends. Ya know what I mean. My team won the next battle. I was doing well, but then broke discipline and ran and helped the E50. I killed the enemy attempting to cap C. I should have capped C to put more pressure on enemy and use the hull down position. 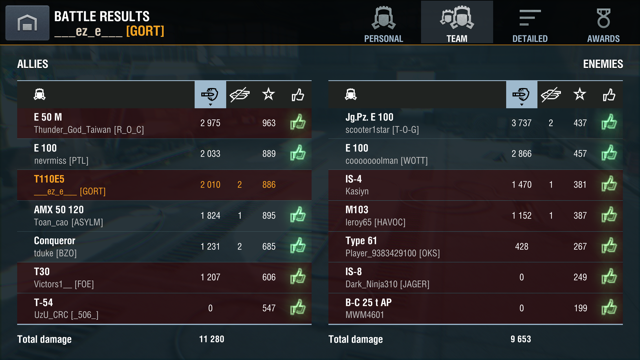 My team was already winning there was no need to lose hp like I did to help E50. My sample size is way to small, but I’m at 62.50% and 2187 dmg for 30 day. I haven’t lost since I took the challenge, but that’s a joke because sample size is too small. This is by far by worst performance since I started this challenge. i will update around weekends as I don’t want to blow up forum. Edited by ___ez_e___, 23 July 2018 - 12:46 AM. Feel free to blow up your own topic, dude. Keep us up to date. Is it wrong but I have his Blitzstars page bookmarked? I’m curious and keep checking for updates on my own. My own latest endeavors with the E5 have been erratic. ‘Latest’ results for Blitzstars show 60% 2450 dmg. E5 in the current meta is an anti-carry tank for pub games playing solo. So far, I’m more concerned about hitting wr then dmg. Every game I lost was because I reverted back to my casual playing style and lost patience and went chasing. Lol. I keep losing patience and chasing when I should use the best attributes of the tank, which is hull down. So I’ve know when I’ve done poorly. The key question for me is how quickly can I organize myself analytical. I understand that you can have the quickest sharpest reflexes, but it’s useless if you can’t put those reflexes in good situation for battle analysis. If I organize it like work then it’s gonna be like a workflow. You know like.... if x then z. So once I get my play style right my decision making will be much more rigid and regulated. My biggest issue currently is being patient and staying disciplined. I’m hoping by next week, I’ll be playing a more disciplined playing style. My play volume will ram up once I think I’m playing a disciplined analytical mindset. I just got to train my brain for muscle memory. Should I post every battle? Replays? I normally used to play on my train commute, but will change my playing habits so there are no excuses about lag afk or any other nonsense. My wr dived but it’s still very early and I’ve got to focus on disciplined game play. Edited by ___ez_e___, 23 July 2018 - 11:16 PM. I'm looking forward to seeing how you do! Edited by SpartacusDiablo, 23 July 2018 - 11:16 PM.